With its speedy data transferring capability, USB 3.0 is definitely the better choice. So what’s holding you back from getting SuperSpeed devices? If it’s the price, you’ll be excited to know what California-based manufacturer Super Talent has in store for you. Warning: after reading, you might be driven to impulse-shop for this product. Introducing the Super Talent USB 3.0 Express DUO 2-CH flash drive, the durable solid-state storage that combines top performance with a budget-friendly price that is meant to suit every buyer’s expectations and needs. The flash drive’s look is classic, with its shiny black housing that only needs a little manual twist to reveal and conceal the port inside. The flash drive comes in 8 GB, 16GB and 32 GB storage capacities with the 8 GB priced for as low as $22 while the other two are at $32 and $73, respectively. So what does the Express DUO 2-CH flash drive deliver? The 2-channel designed USB 3.0 flash drive is able to transfer data at a rate of up to 67MB/s when plugged into a USB 3.0 port. And with its backward compatibility, the affordable USB 3.0 flash drive works with USB 2.0 ports as well, at 25 MB/s. Super Talent always seems to design with the everyday consumer’s needs in the forefront of its mind, and this flash drive is no exception with the use of high quality memory that’s easy on the wallet. The plug-and-play USB 3.0 drive does not require external power to perform and also has a 5 year warranty. What’s more is that Super Talent teams up with Microsoft Security Essentials on this one so expect your USB 3.0 Express DUO to be equipped with real-time protection. Microsoft Security Essentials will provide your home and even business PC the security they need against viruses, spyware and other malicious software. Microsoft Security Essentials works quietly and efficiently, making sure you’re free of interruptions and prolonged wait times. Do you think the Super Talent USB 3.0 Express DUO 2-CH flash drive marks a new milestone for the USB 3.0 technology? Tell us why or why not. 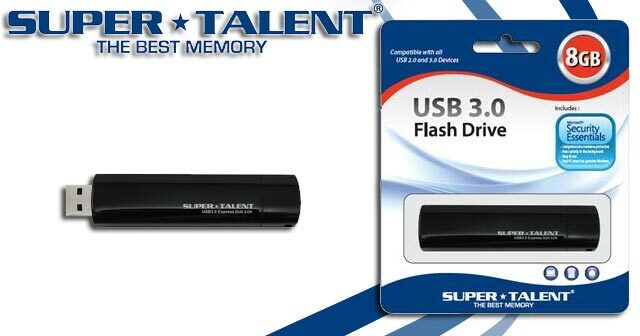 This entry was posted in Articles, Super Talent Technology, SuperSpeed USB 3.0, USB 3.0 Flash Drives, USB Flash Drives, USB Storage Drives, USB Technology and tagged DUO 2-CH flash drive, Express DUO 2CH USB Flash Drives, Super Talent, Super Talent USB 3.0 Express DUO 2-CH, Super Talent USB 3.0 Express DUO 2-CH flash drive, USB 3.0 Express DUO 2-CH Flash Drive, USB 3.0 Flash Drive, USB 3.0 technology. Bookmark the permalink.